BEIRUT, LEBANON (6:15 P.M.) – Armenia delivered 94 tons of humanitarian aid to war-torn Syria this week, the Armenian Red Cross reported on Friday. According to the Armenian Red Cross, at least 30 tons of the humanitarian aid will be distributed to Aleppo via the Leadership of the Armenian Diocese of Beroea. Aleppo was once the most densely populated city in Syria; it was also home to the largest population of Armenians in the region. The remaining humanitarian aid will be distributed throughout Syria in order to ease the suffering of the people after more than seven years of war. Armenia has been a close ally of Syria for many years and continues to be one of the largest donors of humanitarian aid to this war-torn nation. US President's Security Adviser John Bolton met political scientists Davit Shahnazaryan, Suren Sargsyan, Edik Abrahamyan, Stephan Safaryan and Arthur Ghazinyan in Armenia, Hraparak (Square) newspaper reported. During the meeting, Bolton focused the attention on the decision of Armenian authorities to send a humanitarian mission to Syria under the flag of Russia. Bolton did not hide the dissatisfaction with that step and noted that Armenia has done a bad thing, but it would be much worse if it later became clear that it was not a humanitarian mission, but a military one.He noted that if such steps are repeated, Armenia will lose its status as a strategic ally. That is, the American side will closely monitor the mission. Aleppo, one of the most ancient cities located in the north of Syria, became the homeland of a large Armenian community. However, many of Armenians were forced to leave Syria during the war, News Front news agency reported. Aleppo’s Armenian district Midan is inhabited particularly by residents of Armenian nationality, but this district is not the only Christian quarter of the city. It is the eastern areas adjacent to the historical center that was bearing the brunt of the war. This quarter was the main target during the shellings as up to several tens of mines or gas cylinders filled with explosives were flying into the homes of people living there and there was the largest number of affected residents. However, the region is coming back to life. Shops, cafes, mini-workshops and factories have already opened their doors. Now residents will walk the streets without fear. Midan residents are positive and optimistic, they will do their best to recover and rebuild the city. But the most important thing is that the war is over. 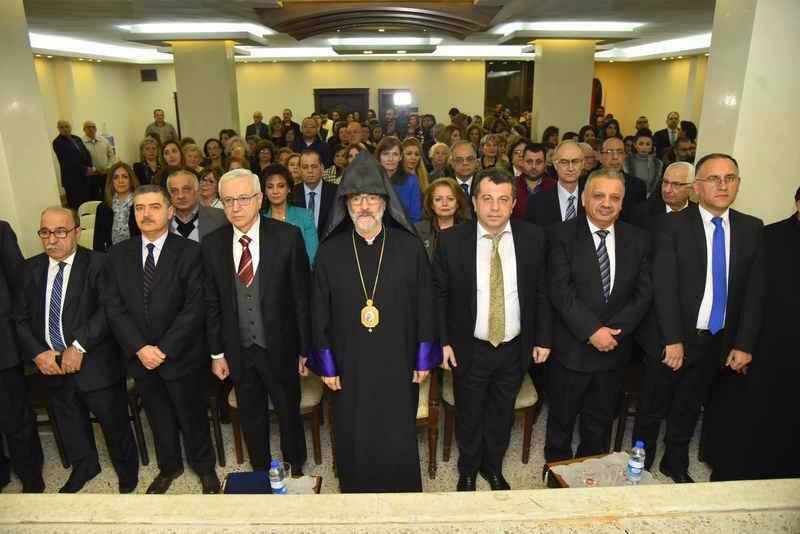 BEIRUT, LEBANON (6:45 P.M.) – The Chairman of the Syrian-Armenian Community in Armenia, George Barseghyan, was interviewed by ArmenPress this week after he and a group of Armenian businessmen met with Syrian President Bashar Al-Assad in Damascus. “There was a task that this Board must boost Syria-Armenia ties. The first step was asking for a meeting with Syrian President Bashar al-Assad. And this request was approved very soon. A meeting was scheduled not only with the Syrian President, but also other high-ranking officials of Syria. The Board has formed a delegation consisting of Syrian-Armenians, Armenian businessmen”, Barseghyan said. Barseghyan told the online publication that Assad vowed to rebuild the Armenian Genocide Memorial Church in Deir Ezzor that was destroyed by Jabhat Al-Nusra terrorists. “The Syrian government plans to give priority in these programs to those countries which stood together with it during those years. Armenia is among those countries which didn’t close its embassy during the war, always kept the state ties and sent an aid to Syria. And during the upcoming progress, business programs and restoration works the priority will be given to Armenians”, George Barseghyan said, adding that the Syrian government highly values the role of the Armenian community. He said it’s not a coincidence that the Syrian President promised to restore the Armenian Church in Deir ez-Zor with his own resources. Syria’s historical relationship with Armenia has paved the way for strong political ties between Damascus and Yerevan. “Our visit pursued several goals. Firstly to strengthen and intensify the Armenia-Syria ties. In addition, we also wanted to express our support to the Syrian President and government. Armenia is one of those unique countries most of the population of which supports the current Syrian government, because we have managed to reach significant success during that leadership’s government. It was a proper occasion to show our support. Eventually, we have an Armenian community in Syria, in Aleppo, Damascus and etc. The local Armenians have very good relations with the authorities, and we also must think about this”, he added. PanARMENIAN.Net - A Turkish prosecutor has prepared an indictment against Necla Demir, the publisher of the Turkish news site Gazete Karınca, over three reports one of which attributed the motivation behind Turkey's attacks on Afrin, Syria to “the 1915 mindset,” referring to the year of the Armenian Genocide, Ahval reports. The prosecutor said the site was "making propaganda of an illegal organisation" during Turkey's military operation in northern Syrian enclave of Afrin. A court in Istanbul has accepted the indictment, which says Gazete Karınca has been "making continuous propaganda for a terrorist organisation," the accused news site reported on Friday. The charges against Demir and Gazete Karınca are principally based on the news site's reports and interviews published in the period when the Turkish Armed Forces declared a cross-border operation in Afrin, a north-west Syrian enclave formerly controlled by Syrian Kurdish groups, on Jan. 20, 2018. "The news site published reports praising an armed terrorist organisation's actions containing violence, force and threats," the indictment said of the news pieces. Besides its Afrin reports, several news items by Gazete Karınca covering Turkey's air strikes in the Iraqi Kurdistan region also featured in the indictment. Demir said the reports the news site released were within the scope of freedom of _expression_ and press and the right to information. The indictment claims Gazete Karınca's reports were "one-sided and accused Turkish Armed Forces of the occupation of Afrin as well as torture and massacre of civilians." "In this manner, (Gazete Karınca) elaborated to report on behalf of the PKK/KCK (Kurdistan Workers' Party and its political wing), and its Syrian offshoot the PYD/YPG (Democratic Union Party and its military wing)," the indictment said. - Mr Sargsyan, the war that broke out in Syria in 2011 destroyed the country’s once-famous cities, including Aleppo. How is life going on today in Aleppo? Have the restoration works launched? 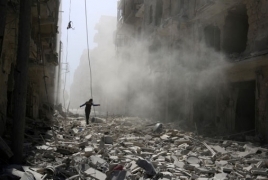 - The damages inflicted by the war are simply reaching alarming proportions in Syria. The human losses that are estimated at hundreds of thousands are especially irreversible. We should pay deep respects to the Syrian people who are overcoming a long-lasting and cruel war turmoil at the cost of great sacrifices, refusing to leave their country and remaining steadfast in their commitment to protecting it. Today, Syria enters a new period of post-war reconstruction and national consolidation. Aleppo is one of the cities that has suffered most of human and material losses as a result of the war. Today, live has got back to normal in Aleppo: shops and public catering facilities are being opened, with vigorous activity observed in almost every aspect of life. The government provides financial support for the construction and restoration of educational institutions and the buildings of strategic importance from its scarce resources. The security level is also on the rise due to consistent efforts. 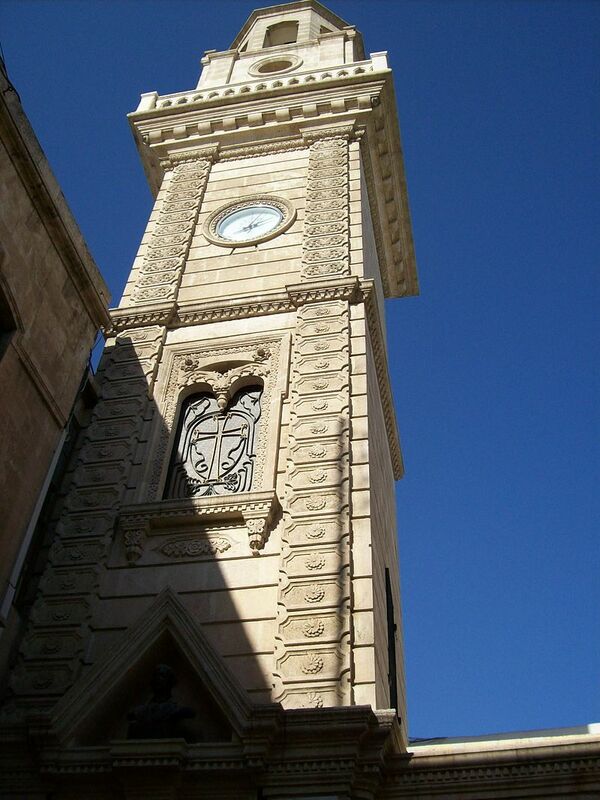 - Aleppo was famous for its large Armenian community established after 1915. Due to the war, Armenians became refugees again, with some of them returning to Armenia. How is the Armenian community in Aleppo and other Syrian cities today? How many Armenians have left in Aleppo? Do you possess some data? - Yes, the war has also left its mark on Aleppo Armenians. Today, only 14-15 thousand Armenians have left in Aleppo from once a prosperous mother colony with a strong national identity, sparing no effort in an attempt to preserve the community's image and the viability of community structures. We can underline with joy that the national life of the community is restoring and entering a new course: cultural events are often held, the consulate-community-partnership and the willingness to organize and implement joint events are on a new higher level. Quarterly visits are paid to mainly Latakia and Kessab, where consular receptions are organized to assist the local Armenians in various consular issues. - Are there cases when Armenians return to Syria under conditions of a relative peace following the ceasefire? - Of course, there are such cases. There are people who return mostly for selling their property and settling themselves in Armenia permanently. There are also cases of permanent resettlement in Aleppo, but the number of returnees is still small. It is noteworthy that a part of Aleppo Armenians looks at their homeland, and many Armenians in Aleppo see their future in Armenia. However, those who want to re-establish themselves in Aleppo are few. We are committed to ensuring the humanitarian needs of our compatriots returning to Aleppo within our abilities. - Throughout the Syrian war, the Armenian diplomatic representations in Syria were among the few that continued to operate. What does it mean to be a diplomat and to work under a war? - Throughout the war, by the decision of the Armenian leadership, the Armenian Embassy in Damascus and the Armenian Consulate General in Aleppo have been working and continue to work with an emergency regime, sharing all the hardships of the war. Up to present, the only diplomatic representation in Aleppo is the Consulate General of Armenia, which is highly appreciated by the Syrian people. For Aleppo Armenians, the activity of the Consulate General is also of great moral-psychological importance for the simple reason that it ensures a link between the Motherland and its authentic presence in Aleppo. I would like to present in short the Consulate’s activity in humanitarian aid anddeliveries to Aleppo. In these years, the Armenian government has dispatched humanitarian aid to Syria six times – the last in July 2018. The staff of the Armenian Consulate General in Aleppo has always assumed the full responsibility for assistance receiving, registration, paperwork and provision of transport means for delivery to Aleppo, as soon as it arrives at Latakia. Amid today’s complicated military-political conditions, assuming such a responsibility is highly risky. This is how the Armenian diplomats work in war zones. Naturally, the work schedule is complex and inclusive, and apart from high level professionalism it is also necessary to be vigilant, realizing the seriousness of the situation and the consequences of reckless steps. - What programs do the Consulate General currently have and what are its priority targets? - The activities of the Consulate in this respect are extremely variable and largely depend on the domestic political developments. In general, as in the previous years, in 2019 as well the Consulate will push ahead with its practice of multifunctional work. terrorists in Syria and elsewhere. When others demolish, Armenians build!!!!!!! The Armenian Forty Martyrs Cathedral in Syria’s Aleppo will reopen in spring after reconstruction, with the church expected to offer the first religious service in March or April 2019, RIA Novosti reports. 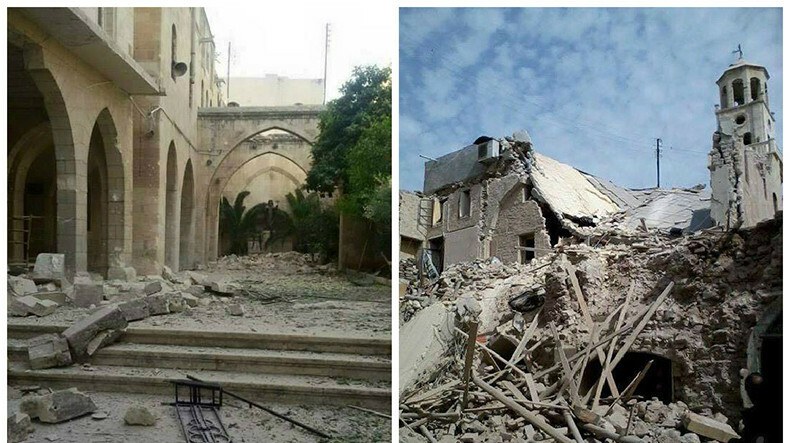 The Armenian church was exploded by the Islamic State militants in April 2015. “The scope of work was tremendous. We had to rebuild the corridor which was completely destroyed. We collected and put together the old preserved stones. It was the most difficult. Almost 70% of the building laid in ruins,” Syrian-Armenian engineer Garbis Tamassian told the news agency. The church already has new doors and windows, with new benches being delivered. The building’s facade has been fully restored, and the finishing work is nearing its end. 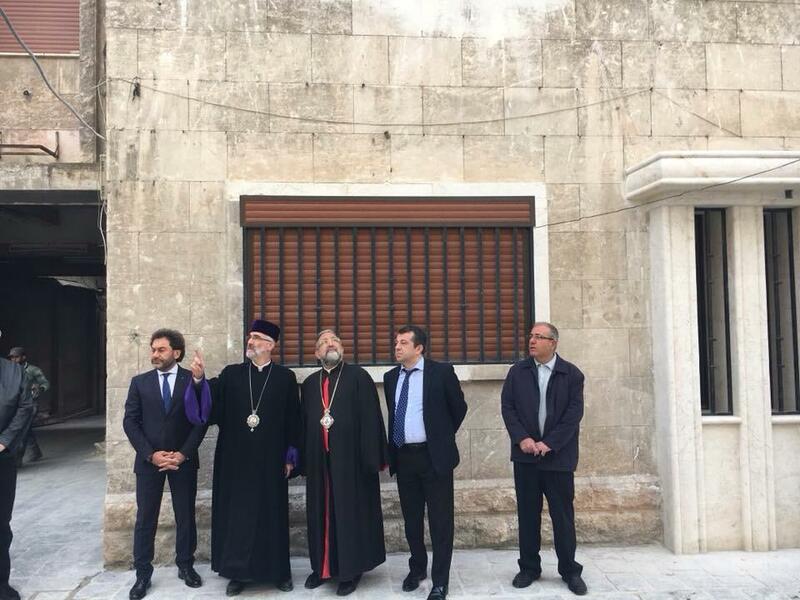 The church reconstruction works have been funded by the Aleppo Armenian community, with some 150,000 people said to have contributed to the repairs. Before the Syrian civil war, an estimated 250,000 Christians lived in Aleppo, which was home to at least 45 churches. Half of them are currently ruined, pending reconstruction. During the war, militants of many terrorist groups destroyed Christian monasteries, cathedrals and churches throughout the country, plundering and desecrating Christian shrines. When others kill, Armenians saves lives! YEREVAN. – Armenian doctors are saving lives in Aleppo. Artsrun Hovhannisyan, Spokesperson for the Ministry of Defense of Armenia, wrote the aforesaid on Facebook. Also, he posted respective photos showing the Armenian specialists, who are conducting humanitarian mission in Syria, helping the injured. An 83-member team—comprising deminers, doctors, and their security professionals—traveled from Armenia to Syria on February 8, to provide humanitarian and professional assistance to the Syrian people. 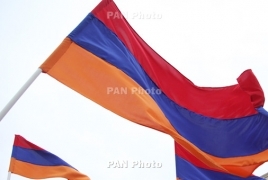 PanARMENIAN.Net - The Armenian flag was anointed at the headquarters of a group of Armenian specialists who arrived in Syria on a humanitarian mission, the press service of the Foreign Ministry reports. The event was attended by Armenian Ambassador to Syria Tigran Gevorgyan, Armenian Consul General in Aleppo Armen Sargsyan, member of the Syrian parliament Zhirayr Reisian, as well as leaders of the Aleppo Armenian community. Member of the group of humanitarian experts Arkady Tonoyan delivered opening remarks on behalf of the Armenian mission. He stressed that peacekeeping is one of the unique values of the Armenian people, and the presence of the Armenian humanitarian mission in Syria is a clear confirmation of that. Special military units from Armenia have begun demining the neighborhoods of Aleppo after Damascus concluded an agreement with Yerevan in mid-February. The Armenian government sent a non-combat humanitarian squad of 83 doctors, sappers, and other servicemen to Syria to provide assistance to the Armenian community in Aleppo. Armenia had previously sent four airlifts of humanitarian assistance to the Syrian people. An Armenian deminer has been injured today during demining activity in Syria, Armenian Center for Humanitarian Demining and Expertise reports. The incident was caused by trap mine with plastic waist. The deminer received a foot injury and was immediately transported to hospital and operated on. His life is not in danger. The demining works, in the sidelines of humanitarian mission in Syria, continue.